Wow! 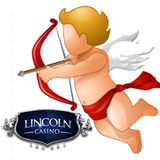 The prize pool the for month-long Big Valentine slots tournament now on at Lincoln Casino is expected to be well over $20,000. The first place player will take 25% with the remainder divided amongst 20 other players. This special Valentines tournament is being played on -- you guessed it -- the Cupid’s Arrow slot game. $3 entry gives players $125 to play with on the game; unlimited re-buys are available. The pot will depend on how many players there are, but Lincoln's manager assures me it will be at least $20K. Month-long tournament will be played on Cupid's Arrow slot from WGS. Cupid’s Arrow, a twenty payline slot game from WGS, has teddy bears, cinnamon hearts, Valentine’s chocolates and engagement rings spinning on its five reels. Three or more scatters (a Valentine’s gift box) trigger 15 free spins. Cupid himself is the Wild symbol that doubles any win that it's part of. Players can bet from one penny up to $10 per spin. Lincoln Casino features dozens of unique games from Wager Gaming (WGS). Its recently upgraded mobile casino for smartphones and tablets features some of its most popular games including Cool Bananas, Funky Chicken and Fat Cat. Players earn comp points playing any of its games including table games -- unlike most casinos that only give comps for slots. This month comp points are doubled when playing the new Mine All Mine slot. Register for the Big Valentine slots tournament under the Tournaments tab in the casino.